I probably eat it five times a year. Did you know you are supposed to eat fish 2-3 times per week? One of those portions should be oily fish. I didn't realize there was an oily fish. I just knew I liked boneless white fish. So what is oily fish? Okay, what about mercury? All fish have mercury, but some have more than others. Check here for a complete list from Dr. Oz. I just discovered that I should have canned tuna three times or less per month. Why? Because it is high in mercury. I have a case of the stuff in my storage room downstairs and guess what? It only has a shelf life of two years. To introduce more fish into our diet, I got a box of individually frozen tilapia from Costco. Now what? Look up some recipes on the Internet. I like finding recipes that have ratings/reviews from people who have actually made the recipe and eaten it. 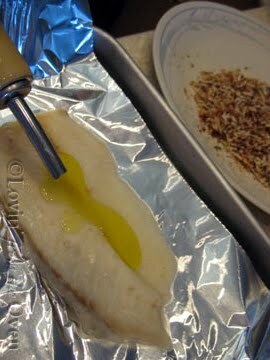 I took my frozen, yes, frozen fish and brushed it with olive oil on a foil lined baking pan. In a separate bowl, I combined the paprika, parmesan and parsley. I didn't have 1 T. fresh parsley, so I used 1/2 T. dried. this looks like a lot of paprika. Put it into a 400ºF oven and cooked it for about 20 minutes. If you have fresh or thawed out fish, it will only take 10-12 minutes. Crispy, cheesy, flaky fish. Too easy, too good to be true, but it is! Now this, I can eat twice a week. 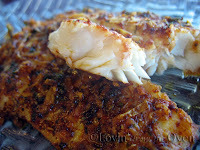 What is YOUR favorite fish recipe? We eat tilapia about 2-3 times a month - the kids love it because it isn't "fishy". 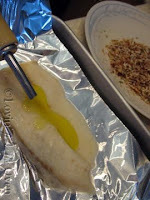 I usually grill it and make fish tacos - so easy and so delicious! Sounds delicious, unfortunately I'm allergic to Tilapia. Either that or it was the seasonings on the Tilapia - but I'm not daring enough to try it again. Good information! I needed a 101 in fish. 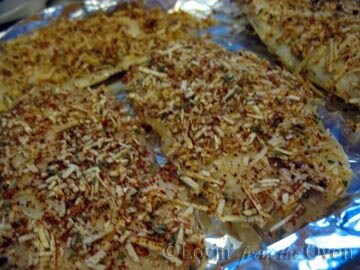 I have some tilapia in the freezer that needs a home, your recipe looks delicious. The crust looks great on the fish! I'm not a fish person, but I had fish THREE times last week. It had to be a personal record. I've only recently allowed tilapia back into my life after a bad tilapia trip several years ago. This looks like a great way to fix it!